New to the Institute for Excellence in Writing? This deluxe package gives you everything you need to start your student on the road to writing with ease and confidence. Plus, you will save $79 when you buy the Deluxe Package instead of purchasing everything individually! IEW Deluxe Package comes with the following items and saves you $79! YES! 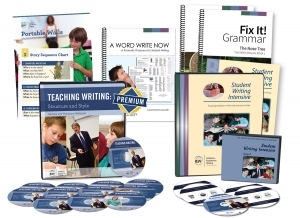 I want to save $79 IEW’s Deluxe Combo Teacher/Student Package for $299. Please ship my order immediately…for FREE! I UNDERSTAND… that the Deluxe Combo Teacher/Student Package comes with a 100% money back guarantee. I may request a refund of the purchase price, as long as the product is in re-saleable, like new condition.